People have played games similar to modern soccer around the world since ancient times. The oldest recorded soccer-like game is the Chinese game of tsu-chu, allegedly invented by the emperor Huang-Ti in 1697 B.C. Records from Huang-Ti's time describe a game played with a leather ball stuffed with animal hair and cork. Two teams vied to kick it through goal posts. The Japanese played a similar game called kemari in the same era. A North African game from the seventh century B.C. was also evidently similar to soccer, though it was a ceremonial game played as part of a fertility rite. The ancient Greeks participated in a game involving kicking and throwing a ball on a marked field. It was called espiskyros. The Romans later had similar games, probably adapted from the Greek. One of the Roman games was called follis, and used a large light ball filled with hair. In follis, the players tried to keep the ball in the air with their hands. Another version was called harpastum. In this rougher game, players tried to tackle the person with the ball. Harpastum was popular among Roman soldiers, and it spread throughout Italy, and then across the Roman Empire. The game was brought to England, and from there its history becomes more narrowly British. The balls used in early Britain were probably made from inflated animal bladders, though there are persistent rumors of games played with human heads. The skulls of either Roman or Viking oppressors were said to have been batted about at various Dark Age revelries. The British also may have had a soccer-like game played with the head of an animal, used in pre-Christian times as a fertility rite. This evolved in the Middle Ages into a game played on Shrove Tuesday. Teams competed to kick the head of an animal around their agricultural fields. The winning team got to bury the head on its ground, supposedly guaranteeing a good harvest. By the 1300s, soccer (at that point called football) had evolved into a rough street game, where opposing mobs injured each other and crashed through houses and stores in their struggle to get the ball through the goal posts. King Edward II outlawed the game in 1314, and subsequent rulers had to renew his decree. As with the Roman soldiers, football was popular with British army men, and they apparently neglected their military training in order to play. The game continued to be played in the streets of England at least through the eighteenth century, but in the nineteenth century, it became an upper-crust game, played at British public schools and colleges. Each school had its own rules, and the first standardized soccer rules were published in 1862, so that graduates of the different schools could play harmoniously. The English Football Association was founded in 1863. The term soccer dates to that time, when in British college student slang the term ruggers was the game played at Rugby, and soccer was the game played according to the Football Association rules. The inner bladder of a soccer ball can be made from either natural or synthetic rubber that is gendy heated and forced into a mold. The outer panels are produced from sheets of synthetic leather backed with several layers of cloth, to strengthen the material. The sheets of synthetic leather are passed through a die-cutting machine that cuts the hexagonal panels and also punches the stitch holes. The panels are then silkscreened and imprinted with the manufacturer's logo. at the ball with the boot to get it away from the player or tripping the player running with the ball) were not adopted by the Cambridge rules, and so Rugbeian teams refused to join the Football Association. In 1871, eight years after the organization of the English Football Association, Rugby teams formed the Rugby Football Union, which drafted its own official rules of the game rugby. With so much strong debate over hacking, the Rugby Football Union also discarded the practice. Over the years, rugby rules have been modified, but still the game and its equipment remains distinct from soccer. Worldwide spread of soccer came with the expansion of the British empire. British laborers working on the Argentine and Uruguayan railroads took the game to those countries. International codification of the rules came in 1904, with the founding of the International Federation of Association Football (known by its acronym in French, FIFA). By the late 1990s, soccer was the most popular game on Earth, with millions of fans and a burgeoning equipment industry. The standard soccer ball is made of synthetic leather, usually polyurethane or polyvinyl chloride, stitched around an inflated rubber or rubber-like bladder. Older balls were made of genuine leather and held shut with cotton laces. Modern balls have a valve. The synthetic leather panels are backed with cloth, usually polyester or a poly-cotton blend. The backing is held on with a latex adhesive. The ball is spherical, and for standard play must be no bigger than 28 in (71.12 cm) around, and no smaller than 27 in (68.6 cm). Its weight is specified at no less than 14 oz (0.392 kg) and no more than 16 oz (0.448 kg), filled to a pressure of 15 lb per sq in (6.8 kg per sq cm). There are two main elements of the soccer ball. One is the inner bladder, the second is the outer covering. Sometimes the whole soccer ball is made under one roof. The 32 panels are sewn together by hand. The stitcher inserts the bladder and sews the final seams. In order to ensure that the bladder has not been punctured by a needle during stitching, a worker pumps up the ball. Then, the finished ball is deflated again and packed for shipping. In many cases, the bladders are manufactured and the covering is die-cut and imprinted with logos at a central factory, and the stitching is done by hand elsewhere. The ball covering consists of 32 hexagonal panels, and the hand stitching of these is tedious and exacting work. Over 80% of all soccer balls are manufactured in Pakistan. 1 Sheets of synthetic leather are backed with several layers of cloth, to strengthen the material. The sheets are fed through a press that applies a latex adhesive and attaches the cloth. Material for a cheaper ball will receive a two-layer backing. A sturdier, more expensive ball will have four layers of cloth attached. 2 After the adhesive is fully dried, the sheets of synthetic leather are passed to a die-cutting machine. Workers load the cloth into the die cutter, which cuts the hexagonal panels and also punches the stitch holes. 3 Some of the cut panels are next taken to a screening area. Workers silkscreen the panels individually, imprinting them with the manufacturer's logo. This is done with a specially fast-drying paint. 4 The bladder can be made from either natural or synthetic rubber. 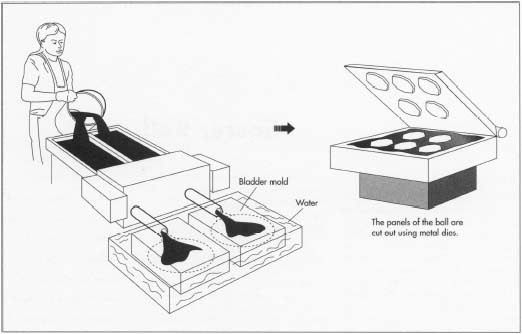 The raw material is gently heated and forced into a mold, where it forms a balloon. As the material cools, it wrinkles. Next, workers remove the bladders and partially inflate them to smooth them out. 5 Now the balls are ready to be assembled. The 32 panels and the bladder are packed in a kit for the stitcher. The stitcher uses a pattern to guide him or her in assembling the panels in the proper order. The stitcher sews the panels together by hand. 6 When the cover is sewed, the stitcher inserts the bladder and sews the final seams. The ball is complete. In order to ensure that the bladder has not been punctured by a needle during stitching, a worker pumps up the ball. The ball may also be weighed and measured at this point. Then, the finished ball is deflated again and packed for shipping. 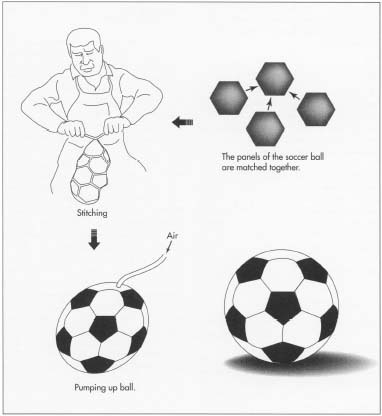 The soccer ball is inspected at many points in its assembly. The bladders are checked as they are removed from the molds. The covering material is checked after it is lined with the backing material. Another important quality checkpoint is the silkscreen printing. The printed panels are visually inspected, and any faulty ones removed. After the ball is stitched together, an inspector looks it over carefully to see that no stitches have been missed. The bladder is inflated and the ball weighed and measured before the ball is passed on to the shipping area. Soccer is the world's most popular sport, and ball manufacturers are vying to create new sensations in soccer equipment. However, the shape, size, and weight of the ball is defined by international rules, and in a traditional sport, there is not too much room for innovation. Manufacturers are testing new synthetics, such as butyl for the inner bladder. For the covering, the aim is to create a softer, more pliable ball. While polyurethane and polyvinyl chloride are the synthetic leathers of choice, manufacturers are investigating new materials or new ways of treating these materials in order to come up with a better ball. In the manufacturing process itself, the biggest change will hopefully lie in the eradication of unfair working conditions. Public outcry in the mid-1990s forced manufacturers to address the issue of child and prison labor. American consumers were confounded in 1994 when it was widely publicized that child laborers, living in appalling conditions of poverty and enslavement, sewed the majority soccer balls. Over 80% of all soccer balls are manufactured in Pakistan, where the stitching was routinely outsourced to remote villages where children did the work. In the mid-1990s, it was also revealed that some balls manufactured in China had been stitched by prison inmates. Under a barrage of negative publicity, reputable soccer ball manufacturers vowed to centralize their manufacturing under one roof, and not sub-contract to outside stitchers. Many of the largest manufacturers instituted human rights departments in order to guarantee that their balls were not being assembled by child or prison labor. Some athletes refused to endorse soccer products unless they had a guarantee that balls were produced under humane conditions. With high consumer awareness of the child labor problem, it is in the best interest of ball makers to monitor working conditions at their foreign plants. Some manufacturers are investing in technology that will eliminate hand stitching altogether. In the late 1990s, automatic stitching machines were able to produce low quality balls, suitable for non-professional play. Manufacturers hope to improve the stitching technology so that all grades of balls can be made by machine in the future. LaBlanc, Michael L. and Richard Henshaw, The World Encyclopedia of Soccer. Detroit, Michigan: Visible Ink, 1994. Cove, Tom. "The Last Word on Soccer Balls and Child Labor." Sporting Goods Business (February 4, 1998). Newell, Kevin. "Goal Oriented: Soccer Companies with an Eye on Growing U.S. Sales Are Getting a Leg Up on Innovation." Sporting Goods Business (April 15, 1998). Schanberg, Sydney H. "Six Cents an Hour." Life (June 1996). wow thank soo much for this information i learned alot form this artical ..